What is a Virginia Month to Month Lease Agreement? Virginia Month to Month Lease Agreement: What Is It? 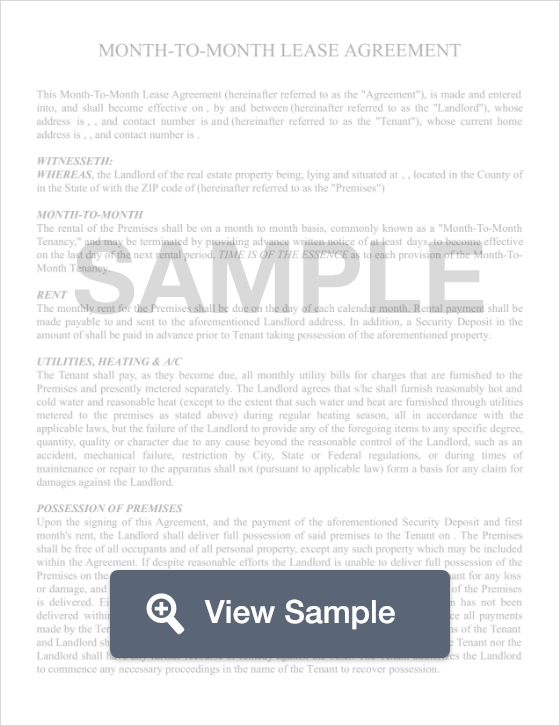 In Virginia, a month to month lease agreement is a document that allows landlords to set up an at-will tenancy with a renter. This means that the terms of the agreement are carried from month to month until month until either the landlord or the tenant terminates the lease in writing. These types of agreements are ideal for tenants who relocate often for work, or only need housing for a few months. For landlords who enjoy the flexibility of an open-ended lease, this means that if they want to make any changes, they only need to provide a 30-day notice. Similar to long term agreements, month to month leases have the same language that lays out information on important terms of the agreement such as rent due dates, late fees, parking provisions and rules of tenancy. Once either the tenant or landlord is ready to end the lease, he or she will submit a written termination letter, also known as a Notice to Quit to the other party no later than 30 days before the termination will become effective. In Virginia, a month to month lease agreement can be canceled by both landlords and tenants. In order for a month to month lease agreement to be canceled, it must be done with written notice at least 30 days in advance.